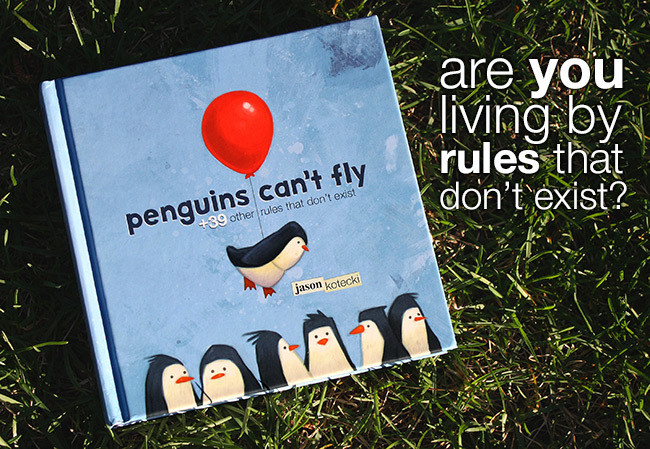 It’s been almost two years since Penguins Can’t Fly was published. It features forty of the most common rules that don’t exist, but with each passing day, I am even more convinced that there are more like forty million, keeping us enslaved to Adultitis without us even noticing. A few weeks ago, I asked Escape Adulthood Insiders to share some of the so-called rules they most love breaking. I got so many good ones! This week, I wanted to play mild-mannered reporter and pass along a few of my favorites, because I they are great reminders for everyone. Which of these “rules” are YOU going to break this week? I break food-eating rules all the time…if anyone was to arrive for certain meals (like in just drop by, not invite) they would be astounded that I wasn’t eating cereal for breakfast or that my night time meal was in mid-arvo…or something else! We often have only dessert for dinner. Who says you have to eat the 4 food groups every meal?